“Notes and Reflections on the Glorious Arms of Imperial Forces in 1689” is an anonymous German-language manuscript preserved at the Military Archives (Kriegsarchiv) in Vienna, Austria, which is itself the translation of a longer work in Italian entitled “Origine della guerra fra l’Imperatore dei Christiani, e quello de Turchi l’anno 1682”. It focuses, among other things, on the Imperial Austrian offensive against Ottoman forces in Kosovo, Macedonia and northern Albania during the Great Turkish War of 1683-1699. The manuscript is of particular Albanian interest as it describes the organised presence of the Albanians and their military forces in seventeenth-century Kosovo. Also of interest is the reference to the Albanian archbishop Pjetër Bogdani and his death in Prizren. The Albanians are mentioned in this manuscript as Albanese and Arnauts, the former term referring no doubt more to Catholics and later more to Muslims, and the Serbs are referred to as Rascians. Manuscript folio numbers and modern place names, where found, have been added here in square brackets for the convenience of the reader. […32r] I believe I have now written enough about Transylvania and have an obligation to describe the deeds of Piccolomini (1) in the conquest of Nissa [Niš], his splendid planning and the chaos that ensued in those reaches after his death, a situation that Veterani (2) was able to repair in hard work using all of his virtue and courage. I will also narrate what took place between the men following Corbelli and those from the region there. When His Grace von Baden (3) left Nissa, he entrusted Count Piccolomini with the command of that town. Advancing towards Procopia [Prokuplje], a large and open town, he took possession of the flour, oats and fodder and set up a storehouse there. In order to protect it, he had the town of Leskovisza [Leskovac] to his left [33v] destroyed and occupied the castle of Costnitz [Koznik] to his right with 200 German and 200 Rascian [Serbian] troops. When all this had been accomplished, he set off on October 14th for Scopia [Skopje], a broad, well-populated and almost completely defenceless town with many merchants. On his march, he encountered a runaway [who told him] that the Turks were going to try and re-capture Nissa. Reflecting on the impossibility of their achieving this undertaking, Piccolomini however continued his march and on the 12th he was in a rugged mountain region inhabited by the tribes of Clementa [Kelmendi] and Rosajaceva [Rožaje] that, with their various settlements and villages, makes up a considerable territory of its own which pays a certain sum of money every year to the Porte. Since there is a war on, the Turkish emperor receives various troops from them in lieu of payment. The General rested there for several days to issue orders on matters pertaining to that region, that had submitted to him voluntarily. The reputation of this commander grew more and more because of his orderliness such that 5,000 Arnauts [Muslim Albanians] in Pristina [Prishtina] who had risen against the Turks and [the inhabitants of] many of the major towns in the vicinity had given to understand that they would submit to the rule of the Emperor. Thus, when he arrived in Pristina, they swore allegiance to the Emperor and at that moment, this large tract of territory came under the shadow of the laurels of His Imperial Majesty. [33r] From Pristina, he advanced on the 23rd to Cazianeck [Kaçanik], a town at the head of a pass. This town had a fortress with solid walls that were surrounded by sufficiently wide moats. When the Turkish troops in Cazianeck, 150 men in all, head about the arrival of the Germans, they fled in the night across the Danube, being pursued in vain by a party of 200 Hungarians and 40 German cavalrymen. But there, our men encountered a large force of barbarians coming from Skopje to reinforce Cazianeck who did not know that their troops had rashly abandoned the place. An armed fight ensued that lasted for over an hour. The Turks then withdrew with several prisoners, but the Christians captured four banners, and the field was strewn with the bodies of the dead and wounded foe. This victory cost the Emperor six prisoners, four dead and ten wounded, among the latter of whom was a Hungarian captain who was gravely injured. On the 25th, thank God, the General arrived from the mountains and camped on the plain. He there learned that many Ottomans had arrived in Scopia, two miles away from them, to defend it and the population to the last drop of their blood. However, he knew from various other sources that the inhabitants of that town were petrified by the arrival of the Germans and were preparing to flee, and all the more so because of the plague that was spreading through that large town. Among the many and varying reports [34v] Piccolomini received was one that informed him that Mamut Bassa [Mahmut Pasha] had withdrawn from Scopia with 8,000 people, of whom 6,000 were soldiers, mostly Rascians and Albanese [Albanians] and was camped in a valley to the right of the town, two hours from our Imperial troops; and they were far enough from Scopia to resist the General and to get away from the disease that had taken over the town. When the Lieutenant Field Marshal was convinced of this, he prepared all of his forces to attack the Pasha. He therefore organised a small celebration at his camp with volleys of fire and in the very same night he sent out 400 dragoons and 200 cuirassiers in the said direction, whereas he himself set off on a march on the 6th before the break of dawn to support his army troops and to beat the Turks, should he encounter them. When Mahmut heard of the approach of Imperial troops and his trembling soldiers heard the firing of their [arms], they withdrew in complete confusion, and when the Hungarians and Germans arrived there, they inflicted much damage on the retreating troops. The disorder was so great that the Pasha’s men left behind all their baggage and several banners and everything else they had with them, leaving everything to the discretion of Imperial troops. This event freed many Christian families from slavery whom the barbaric Mahmut Pasha had taken with him in his wagons. [34r] He left behind him over one hundred dead, as well as prisoners – 100 Muslim and 100 Jews. With the Christians proceeding on their victorious path, the army arrived and the General wanted to camp where the Pasha has been. The latter had taken flight into a forest and was hiding there with 200 of his most faithful men. From there, in the cover of night, he departed for Scopia. On the 22nd, Piccolomini wanted to get close to the town of Scopia and ordered Count Czáky, colonel of the Hussars, to proceed ahead of him and inform him whether the town had actually been abandoned. The Count returned to the General and reported that there was not a single person in Scopia, but that the town was full of food and that the many vaulted shops of the merchants, all open, were brimming with various choice goods. Hearing this, Count Piccolomini advanced to the outskirts of the town where he set up his camp. Thereafter, curious to see the place himself, he chose to ignore the rumour that the town was certainly stricken with the plague. When he entered the town, he sniffed around and investigated everything to the great amusement of his troops. Scopia is an extensive settlement, not much smaller than Prague, indeed perhaps just as large. I just call it a settlement because it has no walls or palisade. It does, however, have an entrenchment [35v] with a little moat and in some parts there are natural elevations. Also here, there were many splendid mosques and lofty buildings, built however in the custom of the Turks, that is to say, of wood, with the exception of the foundations and the ground floors that are made of brick and stone. Farther away from the centre there were beautiful gardens and fountains, situated in the various quarters of Scopia that made it a delight to the beholder. Its location is also a pleasure to behold as it is situated on a broad plain that is fertile in all things and well cultivated. Up to 60,000 people lived in Scopia, of whom there were 3,000 Jews. As such, when the population heard of the approach of Imperial troops, they fled on the 25th of October. Piccolomini observed this expansive town and decided to burn it down, considering the fact that it would be impossible to keep it. Therefore, removing from it all things of value, he set it on fire that very day, that is, the 27th. Others have written that this took place on the 26th. But I am the only one to write about it from firsthand experience. When the General had finished his work there, many judges from the nearby hamlets and villages came by to swear allegiance to His Imperial Majesty. As they were received with great courtesy by the Count, they returned extremely satisfied to their homes. [35r] The time gradually approached and Piccolomini decided to return again to Cazianez [Kaçanik]. When he got there, fortifying [the site] with the troops, he divided up his army and ordered the Duke of Holstein (4) to march on Mount Haemas on November 1st with his own regiment and that of Prince August of Hanover, in order to explore the said region and collect tribute. He arrived with his forces in Lipari [Lipjan] where many chiefs and leaders of the local population had gathered to meet the General and implore him to have the goodness to accept them as vassals and subjects of His Majesty, the Emperor of the West. I can only speculate as to how great the pleasure of Piccolomini must have been when he saw the palm of victory growing before him, without even having to draw his sword from its sheath. When the commander of an army does not have righteousness, piety, mercy, understanding and justice, he can never be called great. It is the duty of an honest soldier to do battle, but whether we are victorious does not depend so much on us, but on whether, after the clash of arms, truth can win and be triumphant. From Pristina the General immediately ordered Strasser to march with his infantrymen and artillery on the fortresses of Panza and Revery [Zveçan? 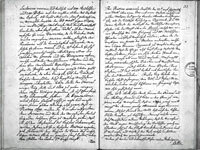 ], the former of which, consisting of thirty settlements and 300 men, [36v] surrendered on the 2nd of November to Lieutenant Colonel von Soyrum, Herr Maussberg. The latter, however, had to be conquered by force. When Strasser left for Bosnia, Piccolomini gave orders, before the 3rd of November, to march on Albania with his regiment and that of Soyrum, and some pieces of artillery in order to find out what his lieutenant colonel, Herr von Hossberg, had accomplished in Bosnien, the capital of Epiro [Epirus]. Fate looked favourably upon this farsighted and courageous disposition, determined by the Count’s illness, that many people believed was the plague. With growing might, further laurels of victory were plucked for the Emperor. Still unwell, he arrived at Capuznitz and spent a day there, the 5th, but then continued to Pani where he learned that the Commander of Pirot with 600 Germans, both infantry and cavalry and twice as many Rascians, had attacked and defeated Nahn [?] bey Dragoman with over 3,000 Turkish infantrymen. Throwing caution to the wind, he endeavoured to venture even further into that country until finally, on the 4th, he was overwhelmingly defeated by two contingents of Turks consisting of 4,000 men. It is amazing how distraught Piccolomini, who never lost heart, was at this. He ordered Strasser to Nissa so that the enemy would not take advantage of the incident and do worse. For his part, he continued his march and arrived on the 6th, as reported earlier, in Prisiran [Prizren], the Capital of Albania, where he was welcomed by the Archbishop (5) [36r] of that country and by the Patriarch of Clementa with their various religious ceremonies. Outside of Priserin [Prizren] there were at least 6,000 Albanese [Albanian] troops as well as others who had formerly been in the pay of the Turks and who are known as Arnauts. When German troops marched by, they gave off three volleys of fire as a sign of their pleasure and then swore an oath of allegiance to the Emperor according to their custom. Piccolomini thus had over 20,000 Rascians and Albanese under his orders, all men of martial temperament, who were willing to undertake any endeavour, however great it should be, in accordance with the will of the General. The Count did not forget to take counsel with the Archbishop and the other German leaders as to whether it was a good idea to trust such a body of men that had changed sides and was three times as large as his own forces. The Archbishop, however, not only assured him, but indeed encouraged him to pursue his victorious course with these ethnic troops and, as such, he issued various orders and instructions in the country to procure enough money and food to maintain such a militia, without burdening the population too much, by whom he hoped later to be assisted. In fact, Piccolomini’s luck did not come naturally, although it was, by the grace of God, to the greater glory of his Imperial Majesty. His way of doing things, his [37v] dauntlessness and his caution in all matters caused him to be held in great esteem by the people. His subordinates would have done well to imitate such a great man who was willing to sacrifice his interests for the greater good. It was he who laid the true foundations for the universal monarchy of the Emperor Leopold. If all of the Emperor’s other military commanders had done likewise, there would certainly be no more Turks in Europe, and I am not even sure how it would subsequently have been with the French, bold as they are. We must close this chapter because the time had not yet come for Roman weapons to return to their original glory, and for the eagle to shade the earth in its lofty flight. Nonetheless, I do hope to experience this before my death. In the meanwhile, the General’s problems increased. He endeavoured to endow his broken spirit with divine and sacramental strength, as accorded to him by the Archbishop. Bereft of all of his strength, he prepared to for an imminent departure for eternity, something which imperial troops greatly feared. 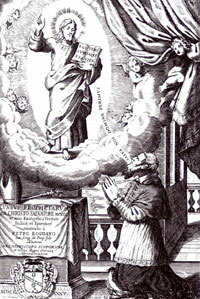 At this juncture, I would like to praise the piety and Catholic disposition of Piccolomini. I will only say the following, that, being at all times a Catholic and Christian gentleman, as a General of the Emperor, he placed his soul in the hands of God on the 9th, at seven o’clock in the morning, [37r] leaving behind memories to those who knew him, and all the more to those would will be acquainted with this praiseworthy deeds. Just before his death, Piccolomini transferred the command to the Duke of Holstein, informing him in detail of all matters. Otherwise things would have turned out differently for, when the helmsman is lost, a ship on the high seas will be buffeted by the winds and will founder. Because the Albanese had been badly treated in such an arrogant manner, they began to lose their disdain of the Turks. Since they were not being held in proper esteem, many of them then returned to the Turkish side. Since the men were now under a greater strain than what Piccolomini had promised them, they began to protest, and proved difficult to pacify, in particular because of the lack of discipline among the soldiers. What enraged them most was that, when they went to the officers to complain and seek retribution for the injustices they had suffered under the militia, they received nothing but contempt, scorn and verbal abuse. It was in this situation that the three regiments summoned by Baden arrived and were billeted on orders from the Duke in the area of Priserin, the direction of their quarters extending all the way to Nissa. 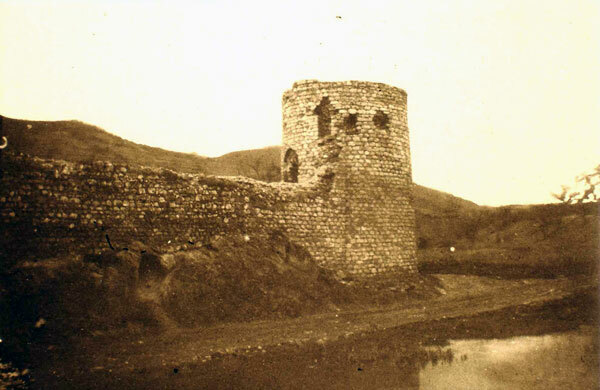 [38v] Thereafter, on the 13th of November, the Arnauts and many Rascian infantrymen, 1,000 men in all, and 100 German cavalrymen under the orders of Herr Sanoski, a captain from Piccolomini’s regiment, were attacked two miles from Prisserin [Prizren] by a force of 1,500 Turks coming in the direction of Skopje who, having been successful in their assault, withdrew and left behind in the field of battle 80 dead on both sides and a similar number of prisoners, of whom only 12 had been taken by our Imperial forces. As this enemy troop returned, the Pasha of Skopje, called Ahmet, who had arrived from Adrianople [Edirne] with his men, wanted to try his luck, and on November 16th, as far as I am aware, to our misfortune, he encountered another group of Rascians, led by commissar Kessler, almost 900 man strong, including some German soldiers and their attendants. Because the sun does not always shine and the commissar was [un]skilled in responding as a true commander, he was defeated and taken prisoner. This made the barbarians all the bolder. The said Pasha then assembled 3,000 Turks and Tartars and many refugees from Stipo [Štip] and led them to that place again. Stipo is a rather large settlement with a defensive barrier or palisade. When the militia arrived there, the inhabitants kept quiet in order to observe the movements of our Imperial troops. [38r] When the Duke of Holstein got word of their presence, he gathered his regiment, that of Prince Carl of Hanover, (6) Seran, Piccolomini and the Hussars of Csaky and many Rascians and Arnauts, since they had been provided with ammunition and food for several days, and set off on the 24th of November for Orisovia [Orizari?]. Marching swiftly, he arrived near Stipo on the 27th in the early hours of the morning, where he encountered not only the aforementioned 3,000 infidels of Mahmut Pasha, former commander of Scopia, but a further 3,000 Muslims. There were therefore 6,000 of them, mostly cavalry, as well as 80 Janissaries and many Arnauts. The vanguard of Imperial troops was led by His Grace Prince Carl of Hanover who assaulted the guards of the barbarians like a lion with this 400 cavalrymen. They defended themselves courageously, but in the end they had to give way to the ardour of the Christians and withdrew in disarray to their army. The main corps, hearing the alarm, came out of the town where they were lodging and wanted to make themselves ready for battle in proper order, but they were unable to do so because they were overrun by the various squadrons that were sent forth to help the vanguard. The prince and four standards of his regiment therefore took several houses and barns to shore up the right wing of the army, to the detriment of the Turks, and compelled [39v] the enemy forces that were not yet lined up for battle to turn around in the field, causing disarray in their own camp. When His Grace, the Duke of Hanover, realised what had taken place with the troops and the right wing, he hastened with the Corps de Bataille and the left wing, that he managed to form in time before the Muslims, and was able to disperse them and cause them to flee. More than 1000 of them were slaughtered by the German musketeers and by the sabres of the Hussars, and many were taken prisoner. What remained for our men, to be able to say that they had achieved full victory, was to put down the reserve force (that had been joined by many a brave Ottoman). The Duke thus ordered the dragoons to attack. This assault proved much more difficult than planned because the defenders in their desperate situation did everything they could to counter this endeavour, which failed. Imperial forces lost 150 soldiers, and if they had not resolved to burn down the palisade, the Christians and their troops would never have razed Stipo. While the flames were raging the tinder-dry wood, they took advantage of the occasion to make a new attack, which proved more successful than the previous one. Surrounded and assaulted on all sides, i.e. by the fire, the Germans, the screaming and weeping of their women and children, [39r] the barbarians finally fell victim to Christian swords. The booty was so enormous that it would sound like a fable to describe it. I have been told by reliable individuals that the solders filled their hats to the brim with silver reals and löwenthalers. The noted success of Imperial arms would have brought about great advantage, had the maxims of the late Piccolomini been followed. However, since they were completely ignored, event on the ground soon got complicated. When His Grace von Holstein left Stipo, they strengthened the defences of Priseren with five companies of the Hanover Regiment and Prince Carl in person, who provided security for the town and region together with the other five companies of Piccolomini. New threats came from Mahmut Pasha who blustered that he would reduce the town to ashes. There were also various disagreements with the leaders of the Arnauts whom the Duke ordered to give up their weapons and disband their militia and to pay tribute to the Germans, as the peasants did. This was an intolerable insult to this free and martial nation. Meanwhile, the Duke was of the opinion that if the enemy could be defeated in all of the towns, these conquered lands could be brought under permanent control and the inhabitants [40v] could be forced into submission to accept the rules of the patrimonial dominions of the Emperor, such as the Hungarians, Bohemian, Slavonian and Germans did. He therefore resolved to pursue Mahmut Pasha with 1,000 cavalrymen from all the regiments and an equal number of German infantrymen, several cannons and many Hussars and Rascians, about 3,000 men in all. He thus set off from Priseren on December 2nd and, marching swiftly, reached the mountains of Luma where he knew that Mahmut Pasha had retired with five to six thousand men. The arrival of the Christians greatly alarmed Mahmut’s troops such that their officers went to him and protested that they would not do battle with our troops under any circumstances and that he should sound the retreat the day before the Duke arrived, being December 3rd. With him, the inhabitants of the surrounding countryside fled immediately, taking their possessions with them. They had always refused to pay tribute to Imperial forces because they had sworn allegiance. When His Grace arrived there, he was unable to get any information at all about where the enemy had gone. To punish the inhabitants, he had several villages burnt down. They then returned to Pristina, with the intention of visiting Peechia [Peja/Peć], where the five other companies of Piccolomini were [40r] stationed. There, they intended to draw a line from their quarters to Petropopoli in the direction of Arcecovina [Herzegovina], a fortified settlement under the control of Topat [Topal] (7) Pasha, former governor of Bosnia. To confound our actions, heaven decided that the Archbishop of Albania would perish, who had kept all of his peoples and most of the Arnauts under control and subject to His Imperial Majesty. Thus, when on December 8th he abandoned this valley of darkness for the joys of paradise, our luck on earth left us with him for a time. In the meanwhile, the Duke was unwell, too. He nonetheless resolved to explore various reaches and lands, sending out Piccolomini’s captain, Herr von Sanoski, with 100 German infantrymen and 400 Rascians. Having left Pristina on December 20th, he arrived in two days’ time at the town of Vellez [Veles], five miles from Scopia that he found open. They attacked the town from all sides and took it, driving the inhabitants into flight. Thirty of the enemy were killed and many were taken prisoner, and countless Turks and Christians living there were scattered. Following this success, many head of cattle were taken by the Christians. Sanoski, thus satisfied, was making his way back when he encountered a large troop of Janissaries. He took ten cavalrymen with him [41v] and went to a certain place near his rear guard to investigate, but was mortally wounded and four hours later, gave up the ghost in Caczenek [Kaçanik], where he had been transported in miserable condition by his men. When the Duke realised that no gain was to be had from hotheads or from our maxims, he began to negotiate with them and with the Turks in a polite and kindly manner. Had he only done so from the very start! Things would then have been much better. But it was too late because the Albanese were now infuriated at the miserliness and arrogance of the German officers who despised them and who thus brought about their own downfall. Despite this, he managed to make amends somewhat and, if Strasser had not encountered such misfortune, Holstein would most certainly have been able to hold onto the conquered territory and frontiers until the arrival of Veterani. An example of this was Rosajo [Rožaje? ], a rather large and fortified town that had rebelled against the Porte and submitted to the protection of Imperial forces on December 12th. In order to give more evident proof of their loyalty, they decided to destroy the defences of the inhabitants of Pilippopoli [Plovdiv?]. When the bey of the said town of Pilippopoli learned of the presumptuous conduct of Rosajo, he turned up on the 23rd in person with 50 Janissaries, 3 cannons, 1,000 Arnauts and 500 cavalrymen. He deployed his Arnauts on a hill and began to fire at the [41r] fortress of Rosajo. The men in the fortress were hard pressed and begged pardon. When this was granted by the bey, they surrendered and returned to their allegiance to the Porte. After this success, the Duke was informed by Lieutenant Colonel von Apremont that a large enemy force of 2,000 men and even more cavalrymen had come from the direction of Soffia [Sofia] and compelled the people of Palancka [Kriva Palanka] to flee on the 20th. The inhabitants of the town consisted of various Rascians, soldiers and various Germans. The same thing happened to the German occupiers of Orsova on the 22nd. He noted in addition that the said force boasted that it would soon grow to 18,000 Turks and Tartars and, with such might, they were going to try and expel Imperial forces from the region of Nissa. Everything he wrote about [in his message] he had learned from two sources. When such information was received from further sources, His Imperial Highness summoned a council of war on December 27th, where they resolved to resist the enemy by all means and to gather the militia. At the same time, unexpected news was received that three thousand Tartars under the orders of Sultan Naradin [Nureddin] had crossed over into the newly conquered territories on rugged paths and had burnt down many villages in the region. [42v] For this reason, the Duke ordered Colonel Strasser, Commander of Nissa, who had arrived to take care of various requisite matters, to go and put down the Tartars with the militia from Pristina and push them back, away from the borders. When Strasser was given command on that day, with a militia consisting of 600 German infantrymen, 500 cavalrymen and 1,000 Rascians, Sultan Naradin wanted to attack him with 1,300 choice cavalrymen and, at the same time, he himself withdrew with his men, together with the booty and prisoners, including several captured Germans, Salvaguards, Hungarians and nationals. Achieving this, he arrived at the edge of a forest and encountered the front of our Imperial forces. In military custom, they joined ranks, giving Naradin enough time to observe the fighting capacity of our men, and to attack them. His only thought was to capture prisoners and to interrogate them to find out what the Catholic forces were up to. He succeeded in doing all of this. It is true that he lost five or six men and left many prisoners behind in the hands of Imperial forces. For his part, he captured two Hungarians and two Germans. When Strasser realised that the enemy had left the region and that it would be a waste of time to pursue them, he returned [42r] to Pristina, where His Imperial Highness, after taking council on the second last day of December, understood that Caccianech [Kaçanik], which was being defended by no more than 100 musketeers, was being besieged and would soon fall into Turkish hands with its 18,000 men. For this reason, the Duke, without waiting any further, ordered the said Colonel Strasser to have the army prepare for battle, without gathering any further supplies for it. The cavalry had 300 dragoons from Styria, 300 from Hanover, 300 from Holstein – in all, 900 cavalrymen who were to be joined there by the regiment of Piccolomini composed of 500 soldiers. 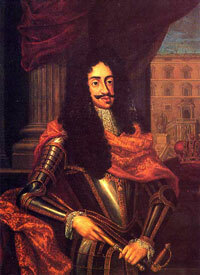 All of the above-mentioned troops were to be under the orders of His Grace, Prince Carl of Hanover. As to infantry, there were only 400 or less musketeers commanded by Colonel Count Solari. The Germans were joined by almost 1,500 fighters, both Rascians and Arnauts, such that the whole army that was mustered in Pristina on 1 January 1690 was 3,500 strong. I do not know why the Duke did not join this expedition himself. One might reply, as was said, that he was ill at the time. When he received word of the defeat of our forces, he departed hastily, a sick man, for Nissa. I have heard that he did not want to suffer the reputation of having lost these borderlands for the Emperor, in particular when he saw that initial steps had gone badly. For this reason, he handed the command over to Strasser. He hoped, as he had been [43v] ordered, that he would not have to confront the much larger force, but that he would have time to gather more men together and try his luck in person in a properly prepared battle and would be able to restore order with victory. His Imperial Majesty discovered that of the 20,000 Arnauts who under Piccolomini’s influence had sworn allegiance to the Emperor, only 300 remained to be relied on, because they had been so badly treated by His Grace and the other officers. Had the Duke not changed his mind when he realised the mistake, he would not have had a single one of them under his command. Even though the remaining men were marching among our Imperial forces, in their hearts they were unwilling. Whoever thinks he can subject great countries with harshness, discipline and modest forces is making a mistake. One can achieve much with an average army, but only by following the rules and taking council when mistakes are made. Holstein initially dismissed these peoples as superfluous and considered them as competition and an impediment to the interests of His Imperial Majesty. Having been persuaded by several leaders that all of these subjected peoples and those who had sworn allegiance, [43r] should pay tribute and should not bear any arms, he believed that a small force would be sufficient to keep an entire kingdom under control. Only then did he come to understand the means necessary to keep these conquered lands quiet and to incite them constantly against the Turks. When they had replenished their earlier militia, they decided to attack the quarters of the Austrians and, egged on by the Arnauts who had been badly treated by our men, returned to their earlier allegiance to the Muslims. Coming back to Strasser, he believed that he could do wonders with his haughty corps and could drive the enemy back to Sophia. By nature he was a violent man and not particularly polite. He was wont to exchange insults with the officers, both Germans and Rascian, that disgusted our men. Even Prince Carl more than once regretted having him under his command. Since Strasser was in essence a soldier, though somewhat too strict, he wanted to provoke the barbarians into doing battle with him. He therefore made the first move, trusting that his men, who in fact did not like him, would not abandon him. [44v] When the troops had marched for four hours, they arrived at a pass, less than a mile from Caccianek [Kaçanik] which they discovered that the Turks had taken. The Colonel camped there and, when he set off at 2 o’clock in the morning, he was advised by a lieutenant colonel of the Arnauts not to advance any further because Turkish forces were too great. However, he made fun of the man and called him a potron [kitten?]. At this, the Albanian exchanged some further words. Enraged, Strasser drew his pistol and shot the fellow in the arm, wounding him severely. He also went even further and had one of the other soldiers, from amongst the Albanians, executed for some minor offence. Ignoring all the warnings, he then proceeded through the gorge of Cacianeck [Kaçanik] and stopped to rest with his corps at a marsh where the Turks could not easily get at them. Thereafter, he left his well-chosen camp on a whim and stopped in an open area which was open to assault from all sides. The Prince of Hanover and the other officers opposed this, explaining to him that once the regiment of Piccolomini and other troops arrived, victory would be certain and that they ought not to risk the crown of His Majesty needlessly. [44r] If one is destined to have bad luck, good council is ignored and no preparations made for the impending catastrophe. Such a man was Strasser who, convinced of the courage of his men and without considering their small numbers, placed himself in obvious danger and provoked the enemy with cannon shots and din from military equipment so that it would come out and do battle. The Turkish army, commanded by the above-mentioned pashas Ahmet and Mahmut, consisted of 3,000 Tartars under Sultan Naradin, an equal number of spahees, 4,000 Arnauts with their aga, and over 1,500 Janissaries also with their aga. The faithless Arnauts maintained contacts with our men. They had abandoned our side because of the bad treatment they had received from the Colonel and because Strasser had sentenced one of their comrades to death. They made it clear that, should the Germans actually attack, they would go over to the Ottoman side and assist in the total defeat of Imperial forces. When an agreement had been reached with that barbaric and inhuman nation, or to put it better, because Strasser wanted it so, Naradin advanced with his Tartars to the right of Imperial troops, where the Rascians were deployed. Initially they proved steadfast, but they were then put to flight and left the area [45v] open. The cavalry and infantry suffered great losses when the Tartars flooded in. While this was happening on the right side, the spahees on the left side were suffering a similar fate. After putting up some weak resistance, they were abandoned by the Arnauts and our whole formation was thrown into confusion. Strasser then endeavoured to repair the damage, as did the brave Prince Carl, but it was to no avail. In this extreme situation, seeing that there was nothing to be done, the courage of a great man revealed itself. He charged between the enemy with weapon in hand, opening a path to bring assistance to his various troops. After accomplishing various extraordinary deeds with this foe and that foe, whom he slaughtered and felled to the ground, he himself finally fell as a victim to the savage enemy assault. Although the magnanimous Germans had lost their beloved Prince Carl, who was beloved and held in greater esteem than many others, and saw themselves confronted with such a fatal day, they nonetheless turned the situation around, resolved to sell their lives at no cheap price. The commanders thus took council and drove the Turks [45r] and Tartars back to their lines and, in the midst of the fire, joining forces in part with their sabres, arrows, with slaughtering and death, and carried through with the battle for a while, achieving deeds of wonder. In the absence of the wounded Strasser, who had remained in the confusion during the first [enemy] assault, Count Solari , with the help of the cavalry, now managed to get the musketeers back into order and have them do their work. The battle then raged all the more and all the bloodier. The Turks would indeed never have been able to achieve victory if our men had managed to keep up their defence to the rear and to the sides. But because they were on an open field and were surrounded by the enemy, they began to lose hope, in particular because their ammunition was low. When the Ottomans observed that Imperial forces had decreased firing, they understood that they had no more bullets and powder. Without further ado, the main corps of the army advanced, attacking the invincible Catholics from the front, from the rear and from the sides. The weight of the attack was such that they could do no other than be defeated. Their souls, however, were not defeated by the burden of their short and arduous live, but were victorious, bearing the palm of victory with them to reinforce the ranks of heaven. [46v] Few of the many men were taken prisoner or remained alive. Some, under cover of night in the nearby forests fled back to Pristina, where they arrived the next day. Many of the officers, including Count Solari, were taken prisoner. As to Strasser, some say that he was seen killed. Others are certain that he was wounded and taken prisoner, and rendered his soul unto God. They say that the field was strewn with the bodies of Imperial troops, and yet a double number of infidels were despatched. When the Duke received news of this sad event, he withdrew to Nissa, taking great caution. Infinite destruction had been caused and German reputation among the inhabitants of the region had been damaged. The remaining Austrian militiamen were petrified. At the same time, they thoughtlessly abandoned the town of Pristina and its storehouse that was big enough to feed three to four thousand men for four months and that contained enough fodder to get 1,200 horses through the winter. There was nothing to be done, and had Veterani not returned to this border region, it would have been lost right up to Belgrade. Strasser’s [46r] misfortune was one of the reasons for this disaster. His Majesty’s armies in Transylvania and in Serbia had been destroyed and were unable to recover and resist any advance the enemy would seriously endeavour to make, as they later did. Meanwhile, Piccolomini’s regiment was marching under the colonel, Count Monticelli, to meet up with Holstein. It arrived near where the defeat had taken place on the day after the battle, i.e. the 3rd, without know at all what had happened. Coming upon various units of Tartars here and there, he attacked them and drove them into flight. In doing so, he took three men prisoner. Interrogating them, he realised with tears in his eyes the tragedy that had befallen the Imperial soldiers. For this reason, without hesitating any further, he marched to Pristina. He had been marching a mere half an hour when saw the whole fury of the Tartars behind him at full speed. There were a thousand of them, with Sultan Naradin in person, who had remained behind with the greater part of his men while the triumphant Turks were departing for Pilipoppoli [Plovdiv], taking the [47v] booty, the prisoners and the cannons with them. From the interrogation of the three afore-mentioned prisoners, Monticelli was convinced that he would probably have to do battle. He thus spoke to his officers and men, inspiring them to live and die with him. When he saw the enemy swarm approaching rapidly, he sought only to cross a bridge and position his men in a small marsh. Making ready there, he awaited the enemy. He also had a courageous lieutenant and 40 cavalrymen guard the bridge that the whole regiment had just crossed. The battle lasted over two hours. The Christians fired volley after volley at the barbarians with their flint guns and the barbarians rained arrows down upon the Catholics. But the bridge and the marsh lay between them. As such, the Tartars were unable or did not have the courage to attack our men from the rear. When evening approached, the colonel, in full battle gear, led his men through the marsh, accompanied for a time by the screaming and howling of the Muslims, but they were not molested very much from nearby. In this dress, he reached Pristina after [47r] midnight and noted that he had lost only twenty soldiers and that only one captain and a few common soldiers had been wounded. Monticelli made preparations in Pristina and simply replenished the troops. He then made his way back to Scopia. One must praise the virtue, courage and conduct of the said Count. All officers ought to be like him. One should only enter battle when it is absolutely necessary or when one perceives an advantage for one’s superiors and the country in general. To avoid battle with a large power is a true sign of courage and not of fear. But when one is forced to do battle, one should do so and one will come out victorious because true virtue and true courage are the boon companions of luck. Veterani was wounded in Wallachia. He received orders from His Grace von Baden to join the command in Nissa. In this situation he set off for Belgrade simply because he and his men were lacking food and fodder for their horses. For this reason, the march in the depth of winter was particularly arduous. [48v] When he finally arrived in Belgrade, he learned of the fate of Strasser and of the many other well-known officers and soldiers, and thus set off at great pace in that direction. While the Count was endeavouring to reach Nissa as quickly as possible, he was met by two couriers, five hours apart from one another, whom the Duke had expedited to the Court to inform it of the great assembly of Turkish forces. 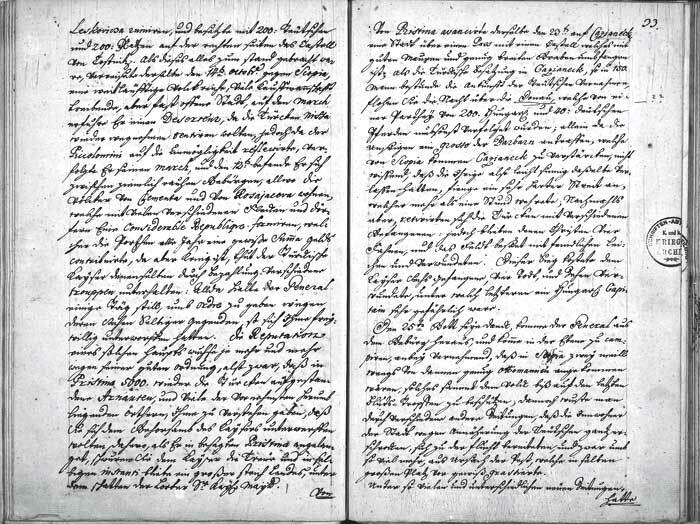 From them he received a letter from the colonel, Count von Herberstein, who informed him about Strasser’s defeat. As the Count proceeded on his way, he noticed more and more signs of the trepidation of the Germans. In such a chaotic situation, confusion and fear increasingly took hold of the Duke. All quarters were on the move and everyone was either abandoning the militia, withdrawing in disarray, or they were acting like birds sitting on a branch ready to take flight. The Duke was ready to abandon Nissa to the foe because it seemed impossible to defend. However, because of Veterani’s strict and unbroken order, which the scattered soldiers respected and which reduced the confusion, this did not occur. [48r] He soon reached Nissa itself, bringing order with him and, mustering there from the occupied town and the surroundings a corps of men and three cannons, he set off in the direction of the barbarians on the 9th of January. He gave courage to the intimidated Imperial troops with these deeds of a General and with dauntless words to all. At the same time, he sent strict orders to all quarters and units that all officers and soldiers should remain where they were, on pain of death, even if they had no more food and fodder. Even though the Turks and Tartars were burning and laying waste to the lands paying tribute, they would have to make a virtue of necessity for a while and eat horse meat and, if needs be, advance their positions. Only Veterani was capable of overcoming such a terrible situation. What was needed was a dauntless and resolute militia that would show love and respect for him, a man who affably observed justice and keep his word. While he advanced, more to make an impression than actually to find and engage the enemy, he did not forget to write to all of the authorities of the country to encourage them to continue to show loyalty to the Emperor [49v] and to promise that they would soon be relieved and saved from the Turks. In truth, I do not really know if the name Veterani frightened them or if he was just lucky. He was after all sufficiently known and held in esteem by the Muslims. I can only say that the great preparations and show of strength that the latter had made a few days earlier dissipated, just as birth and growth lead to death. This gave the General time to arrange his affairs and to get everything into order at his headquarters, as follows: He ordered the regiments of Strasser and Herberstein and half of the regiment of Seran to be deployed in Nissa. The rest of Seran’s men would be deployed in Procopia under the command of the lieutenant colonel of the Hayduks, whose whole regiment was situated there. In Pristina he commanded the Duke of Holstein with the regiments of Apremont, Auesperg and the dragoons of Hanover. Joining the said regiments were the cuirassier regiments of Styria, Hanover and Holstein. To Prisren he sent Colonel Antonio with his Rascians, many Arnauts and 200 musketeers. Having taken these decisions, he re-established the foundations of the congress people [?] and returned immediately to the field, in particular when he heard that the infidels had [49r] abandoned it. It is quite unbelievable how the Turks were put back in their place when, at a certain moment, they noticed that the fleeing Germans had turned their dauntless brows back towards them and retaken their previous positions. They even advanced to the borders of Macedonia and Caczianeck [Kaçanik], a large city that had been abandoned by Imperial forces even before the death of the Archbishop of Albania. These regions were occupied once again and Veterani endeavoured to take and reunite not only the lands in front of him, but also those in the rear and to the sides. He was therefore particularly courteous with the leaders of the Rascians, Colonels Pranisova and Studeniza, and deployed them in the area of Jagodina to hold the roads in that region. When everything was done and ordered according to his haughty will, he sent a courier back to Court and shortly thereafter dispatched a colonel, Count Seran, to inform it of these events. 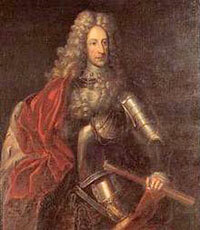 Margrave Ludwig Wilhelm of Baden (1655-1707). Pjetër Bogdani (ca. 1630-1689), Ital. Pietro Bogdano, Albanian writer and Catholic religious figure. In 1656, Bogdani was appointed Bishop of Shkodra and, from 1677 to his death, he served as ‘Archbishop of Skopje and Administrator of the Kingdom of Serbia’. Prince Karl Philipp of Hanover (1669-1690), brother of the future King George I of Great Britain.